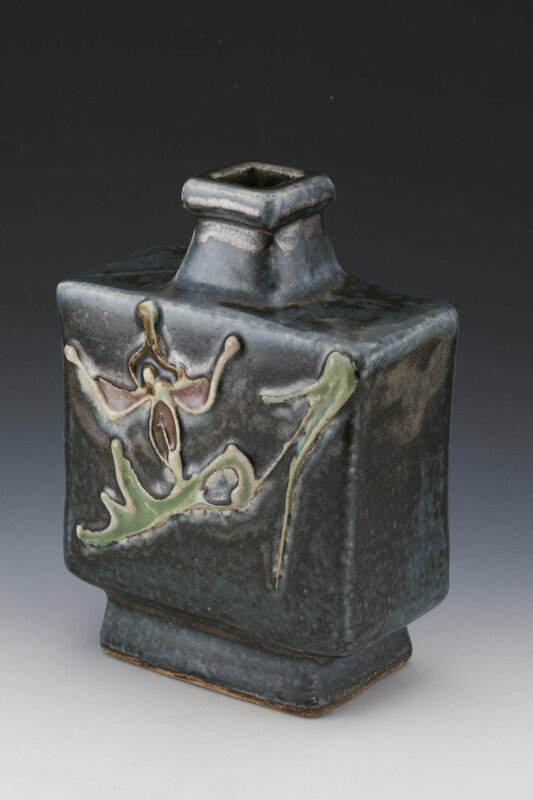 Five Cranes Gallery features works by Mingei's founders Hamada Shoji, Kawai Kanjiro, and Munakata Shiko while reaching back to 19th century studio potters like Otagaki Rengetsu. We also explore the new directions taken by next-generation Mingei heirs like Shimaoka Tatsuzo, Hamada Shinsaku, Hamada Tomoo, Kawai Buichi, Euan Craig, and others. Even farther afield, Five Cranes highlights outstanding functional pieces by several of the foremost contemporary Japanese ceramic artists, including Goro Suzuki, Takeuchi Shingo, and others. Kawai Kanjiro (河井 寛次郎, 24 August 1890 - 18 November 1966) was one of the founders the Mingei movement, alongside Bernard Leach, Hamada Shoji, Tomimoto Kenkichi, and Munakata Shiko. Becoming interested in pottery as a child by watching a nearby farmer who made pottery in his spare time, Kanjiro knew by the age of 16 that he wanted to become a potter. He graduated from the Tokyo Higher Polytechnical School in 1914 and worked briefly at the Kyoto Research Institute for Ceramics. Hamada Shoji, whom he first met in Tokyo, moved to Kyoto as well, and the two young potters reportedly conducted over 10,000 experiments with glazes. Disillusioned with what he felt was an unnecessarily excessive focus on studying theory at both schools, in 1920 Kawai built his own kiln in Kyoto, a"noborigama" climbing kiln - the Shokeiyo - with eight chambers. Although Kawai was trained in the use of chemical glazes and gained wide recognition for their use while still in his early twenties, he was ultimately dissatisfied with this early work and, thanks in large part to his chance encounter with Yanagi Soetsu and Hamada Shoji, turned instead to natural glazes. He is widely regarded as a master of glazes, especially of warm red copper (shinsha or yuriko - one of his trademark colors), rich brown iron (tetsu-yu), chrome and cobalt (gosu). As a potter he sought to combine modern methods of manufacture with traditional Japanese and English designs. He was also an artist, calligrapher, sculptor, writer, and philosopher. As a man who respected the dignity of simplicity and collected the works of poor craftspeople from all over Asia, he admired "ordered poverty," had a profound love for the unpretentious men of the soil, and made their simplicity a part of himself. His pots come in many asymmetrical shapes and show expressionistic techniques such as tsutsugaki (slip-trailed decoration), ronuki (wax-resist) or hakeme (white slip). Kanjiro refused all official honors, including the designation of Living National Treasure. Like his lifelong friend Hamada, Kawai never signed his work but would affirm that his work itself was his best signature. His pieces are on display in the Folk Art Museum of Tokyo, among others. Kawai was also a poet and, like his pottery, his writing is strong and unconventional. In 1953, he published a collection of poems entitled We Do Not Work Alone. and sneak peeks of upcoming listings. © 2018 Five Cranes Gallery - All rights reserved.